Lefkada beaches include some excellent choices. Egremni beach is one of the best in Greece, while the likes of Porto-Katsiki, Kathisma, and Agiofili are not far behind in beauty. 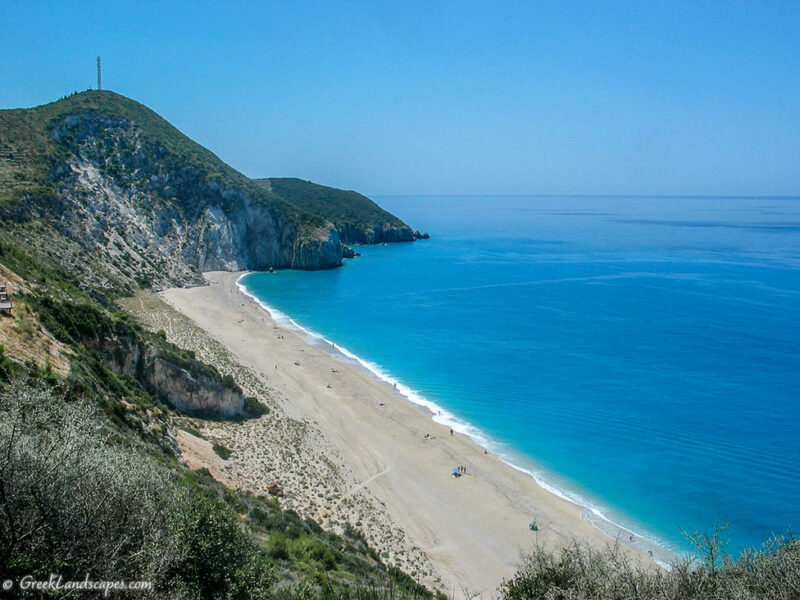 Agiofili beach is one of the best in Lefkada island. Access: To reach the beach by car you have to drive over some very difficult dirt road before parking. Then you have a ten minutes walk on a goat path to the beach. The best way to get there is by water taxi from Vasiliki. The water taxis return in the afternoon to pick up bathers, although if waves prevent the water taxi from approaching in the afternoon, you might have to walk about 45 minutes back to town. So take your walking shoes along just in case. Amenities: bring your own drinking water and food. No amenities anywhere near the beach, so bring your own water. Amazingly enough you can rent a beach bed and umbrella! Notes: Very nice beach, although the waves do pick-up in the afternoon. Getting there is not easy, but the beach is so small that it could not handle big crowds anyway. Agios Ioannis – Miloi beach from above. Lefkada island. Ag Ioannis/Miloi beach near Lefkada town. Ag Ioannis and Miloi beaches are the same sand band at the edge of Lefkada town. Access: a good, paved road runs parallel to the beach. You may park on the road. It’s an excellent place to park an RV, and most windsurfers do just that. Amenities: There are several restaurants/cafes on the beach. Most at the southern end. Notes: This is one long beach with the south end named Agios Ioannis and another part named Myloi after the old windmills that are found there. At the south end the beach is organized with a lifeguard on duty, while the the area called “Myloi” is preferred by windsurfers. Obviously, swimming at this spot uncomfortable so move a bit to the north or south to find some space. You will find the the most quiet spots for swimming toward the north of the beach. The small beach at Agios Nikitas village in Lefkada, Greece. Access: If you live or stay in a hotel in Agios Nikitas this beach is within walking distance, and you probably park at your hotel’s parking lot. If you on the other hand drive there by car, hoping to spend the day at the beach, parking is only available at the main road which tends to get very crowded in the summer. The walk to the beach takes you through the town of Ag. 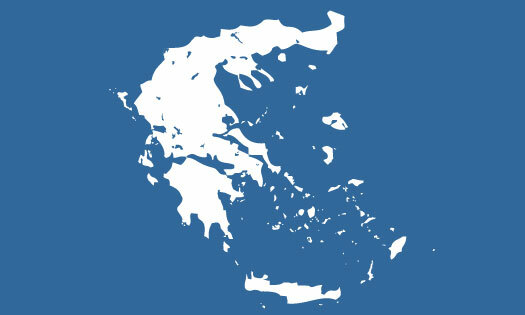 Nikitas. Amenities: The town of Agios Nikitas frames the beach, and all its restaurants and stores are within walking distance. Notes: This is the little beach right at the edge of Agios Nikitas. It is flanked by restaurants, hotels, and bars, and also serves as the port of the town with few fishing boats and water taxis sailing around. A better option would be to take the water taxi for a five minute ride to Mylos beach which is one of the best. You can also walk to Mylos beach, but the path through the cliffs is steep and dangerous. Pefkoulia beach is also nearby near the road before you reach Agios Nikitas, and Kathisma beach is a couple of kilometers farther south. Access: Good paved road will bring you right to the beach. There is parking under trees nearby. Egremni is a long, quiet beach in Lefkada island. Egremni beach is one of the best beaches in Greece. Lefkada, Greece. Egremni beach is one of the best in Greece. It’s hard to access by road, but easier by boat. Since we have chosen it as one of the best beaches of Greece, it has its very own page. Notes: The beach near the town of Lefkada is vast. There are areas where bathers concentrate, usually around restaurants or bars, and there are large stretches that are completely vacant. Most people seem to concentrate at the two ends: near the castle at the north, and around the deserted windmills (Milos beach) at the south end. Kathisma beach, Lefkada island, Greece. Access: You will reach Kathisma beach on the west coast of Lefkada through a narrow road that goes through small towns, olive groves, and endless hills. In the high season you can expect to be stuck in long gridlock, especially around the town of Agios Nikitas. Amenities: There are plenty of restaurants, cafes, and trendy bars at the beach. The main part is lined with parasols for hire. Notes: Kathisma beach is a very nice beach full of life. It is well organized with ample parking, restaurants and kiosks within easy reach. It is also full of youthful beach activities like volleyball and tennis courts, and parasailing and hand gliding from the steep hill above. 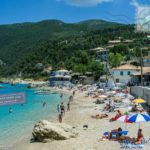 Kathisma used to be one of the best beaches in Lefkada, but in high season the crowds can bee overwhelming. Regrettably, Kathisma has been over-built with bars, restaurants, hotels, and apartments, and it has acquired a reputation as a “party” beach. As you know, parties come with plenty of noise pollution. The middle of the beach has been taken over by loud bar music and beach games, but the two ends of the beach are more quiet. If you are looking for a “party” beach, Kathisma is not a bad place to swim at. If you want more peace and quiete, a good choice would be Egremni to the south. Access: Mirkos Galos is accessible via a nice, paved road. You will find ample parking on the road. Amenities: The town is within walking distance, and there are plenty of restaurants and cafeterias on the beach. Access: Milos is not easy to get to, and that keeps the crowds away. You have to park somewhere near Agios Nikitas town, and walk 20 minutes on a steep goat path to Milos beach. The easiest way to get there is by water taxi from the nearby town of Agios Nikitas. Amenities: The nearest shop is a 20-minute walk away, over the same goat path you took to get to the beach. So, bring your own water and food for the day. Notes: Milos beach is an excellent choice if you are in Lefkada. It’s never crowded, and it has not been commercially exploited, despite its proximity to the most touristy town of Lefkada’s west coast, Agios Nikitas. Being on the west coast, it is susceptible to large waves. It is also steep at the breakers so you might find it a bit hard to get in and out of the water. The south end is a favorite with naturists. One of the narrow beaches at Nidri, Lefkada, Greece. One of the small beaches in Nidri, Lefkada. Access: Nidri beach is right at the edge of town, so it’s easily accessible, though parking in town near the swimming spots is not easy to find. Amenities: The town of Nidri is within walking distance. There you will find plenty of restaurants, cafeterias and shops. There are several hotels right on the beach as well. Pefkoulia beach from above. Lefkada, Greece. Access: The main road of the west coast passes right over Pefkoulia. An access road will bring you to the southern end of the beach. In high season it’s hard to find parking there, so you might have to park on the main road and walk down. The northern end of the beach is only accessible by walking the length of the beach from the south end. Amenities: There is a restaurant at the south end, but not much else. Notes: Pefkoulia beach is a favorite one with free-campers. Since the entire north stretch is not accessible by car, you will find many tents tacked under the trees that frame the beach. Pefkoula is the first nice beach you will encounter as you drive on the west coast of Lefkada from the main city, and it’s not a bad place to swim. A bit farther south, you will find Milos beach (see above). Porto Katsiki beach is a busy place by mid-morning. Lefkada, Greece. Panoramic view of Porto Katsiki early in the morning. Porto Katsiki beach in Lefkada island, Greece. 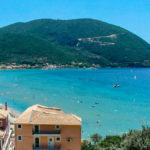 Access: The best way to reach the beach is by boat, and every day-cruise from Lefkada, Nidri, and even Kefalonia island make a stop at Porto Katsiki. Driving to the beach in the summer is not for the faint of heart. The road is way too narrow to fit two cars side by side most of the time, and the traffic is unbelieavable in July and August.Keep in mind that there are no gas stations between Lefkada town and Porto Kasiki so fill up before you go because you might be stuck in idle traffic for hours. You can expect major traffic jams around the village of Agios Nikitas and after you take the turn from the main road towards Porto Katsiki.Once you reach the beach, you have to park in a make-shift parking lot (pay) near the beach, or on the sides of the road way before it. From there, you still have to climb down about 100 steps to reach the water. Amenities: There are a couple food kiosks above the beach, but not much else. Unfortunately, there are no toilets anywhere in the area. A make-shift portable toilet near the parking lot is usually so disgusting, the surrounding rocks and shrubs become a minefield. Notes: Picturesque Porto Katsiki beach often features in best-of-Greece polls and lists. We certainly think it’s one of the best, but its beauty has a price: the beach is too small for the crowds. But you will definitely enjoy the dramatic setting. The beach is carved out of the soft limestone mountain. It’s vertical cliffs hang vertically above the fragile white beach and the turquoise water. If you want to have some space, get to the beach before 10 am, because that’s when the boats arrive. Unfortunately, at this time the entire beach is shaded by the cliff behind it (the beach faces west). The sun begins covering the beach after 11 am. Usually in the afternoon the sea picks up and the waves take up about half of the beach width, leaving a narrow band for sunbathing. To make the experience more interesting there is a number of travel agents who walk up and down the beach handing out brochures for daily cruises from Nydri and using megaphones to announce them as well! Our idea of a beautiful beach does not include a guy with a megaphone, so If you feel the same way you might want to skip Porto Katsiki, and instead head for Egremni nearby. The access there is harder (about 300 hundred steps to climb), but you will really enjoy peace and quiet in one of the best beaches of Greece. To really enjoy Porto Katsiki, visit the beach early in the summer. Late May and early June is less crowded and easier to get to. 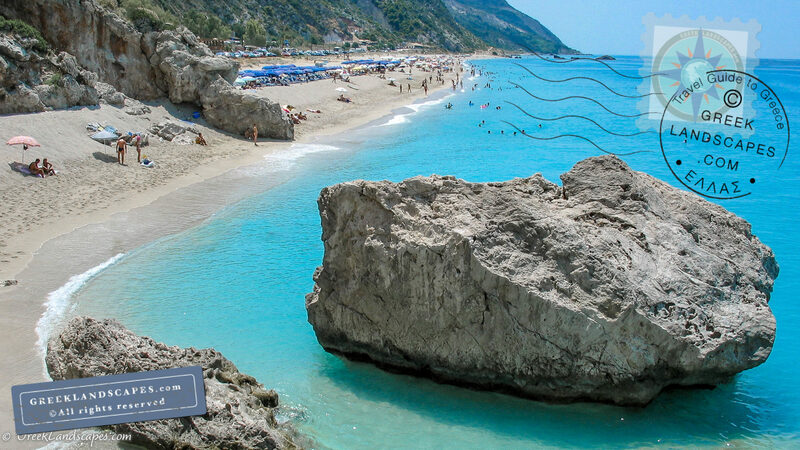 If you are in Lefkada, you must absolutely visit Porto Katsiki because even with it’s drawbacks, it’s a spectacular beach to swim at. Vasiliki beach is a favorite windsurfing spot. Lefkada, Greece. Access: The beach is easily accessible by car. Amenities: You will find restaurants and cafes at the beach, and the town is within walking distance on the east end. There are also several windsurfing kiosks and classes. Notes: Vaslliki beach is a well established windsurfing spot. Any given day you can watch the spectacle of hundreds of wind surfers taking advantage of the strong winds that blow through the bay. The beach itself is right at the edge of Vasiliki town. It’s not a bad place to swim, but there are a much nicer beaches nearby. You can take a water taxi Agiofili, Proto Katsiki, or Egremni, all of which are among the best beaches in Greece. From Vasiliki you can catch a short ferry ride to Kefalonia island to the south. Our beach reports are based on personal on-site visits. 5 = Superb! Best we visited. We would travel around the world to swim there again. 4 = Excellent. 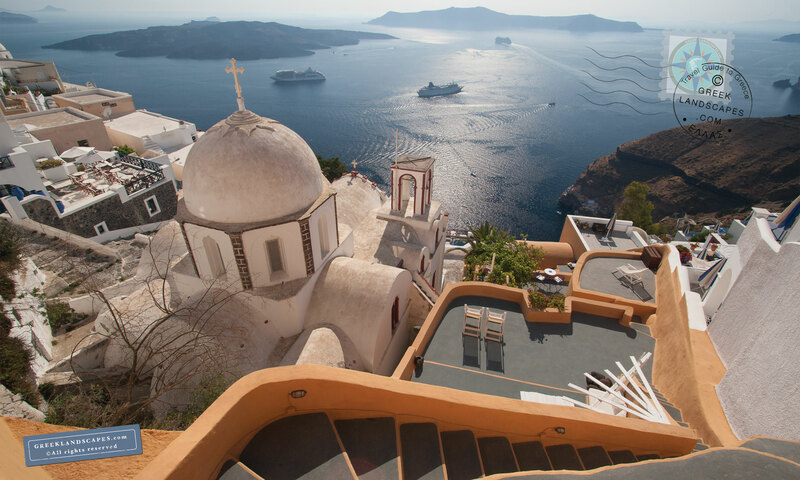 We would travel across Greece to swim there. 3 = Good. We would choose it among other beaches if we were in the area. 2 = Average. We would return to this beach if we were in the area, but not as our first choice. 1 = Disappointing. The beach was fine for one visit. We would return if desperate. 5 = The sea water felt wonderful and clean. We would go way out of our way to swim there again. 4 = The sea water felt good and we would go out of our way to swim there again. 3 = The water felt nice and clean. We would swim there again if we were in the area. 2 = Nice sea. We had a good swim but did not notice anything special or unusual about the water. 1 = The sea water was not very inviting when we visited. The beach reports and ratings are based on our simple (and unscientific) observations during our visit. We enjoy the sea water when it’s crystal-clear and cooler rather than warm. We don’t enjoy swimming among flotsam any kind. We also like the sand to be clean of debris, and a bit more more coarse than the fine, “sticky” kind. We also prefer the more undeveloped beaches (ie. the ones without bars, music, loud crowds, or salespeople). Certain beaches we have visited once, while many we have seen several times. It is possible that conditions have changed since our visit, so use these reports as another point of reference in your research.